How can ufologists best help or support UFO abductees? Recently, a notice was posted online which noted that a support group for UFO abductees was going to be created in a nearby city. Anyway, I responded to the post online, offering encouragement and asking about the clinical professional who would be leading or facilitating the group. Excellent! Which local clinical therapist will be facilitating? The abductee support group I helped with in Winnipeg back in the 1990s had a psychologist and a counselor for referrals too. I think both might be necessary, especially if some abductees are experiencing significant anxiety. We helped a number of people through their fears and concerns. The reason I know the importance of working with a clinical professional was because several of the abductees who were members of the group turned out to have issues best dealt with by professionals, not ufologists. One woman had been raped and her memory of her "abduction experience" was a screen for the horrific trauma she had endured. Two other abductees attempted suicide because they were living in fear and paranoia since the aliens were watching them day and night. Others had showed signs of other issues that needed the assistance of professionals. Such trauma is clearly beyond the realm of ufology, and it is clearly in the best interests of "experiencers" to help them as best as possible. [It would be bad] If everyone has to talk in front of a psychiatrist who is not an experiencer that is treating it as mental illness. He knows NOTHING about UFOs. People need a safe environment ..., not a court room or mental examination room. I was aghast. This was hardly the reaction I had expected. It showed a lack of understanding of both how clinical professionals view people in need and also how support groups for people with various issues are actually developed. It's also not a matter of speaking in front of a psychiatrist who would be judging you on your sanity. If a person is traumatized by his or her abduction experience, it is all the more important to have someone present who can help. It's not a matter of treating abductions as mental illness. It's that abductees experience trauma and have symptoms of anxiety and other issues, which can and should be treated by professionals. And yes, many 12-step programs are led by clinicians. ...will be called "experiencers anonymous." It will be modeled after Alcoholics Anonymous and the famous and extremely popular experiencers sessions held every morning at the International UFO Congress in Phoenix every year. The group advocates a different perspective. Safe space with people who personally KNOW what you are going through is so healing in itself. I firmly believe that abductees should be helped primarily by qualified clinical or medical personnel. This is not to say that all abductees are in need of medical attention. What this does mean is that abductees who are bothered or upset by their experiences and who are highly anxious should be seen by clinical psychologists or psychiatrists who have the experience and training to deal with emotional problems and mental health issues. The reason for this is because, as revealed in the literature, many abductees display symptoms of severe trauma, possibly as a result of their experiences, and also possibly from earlier times in their lives. As compassionate and caring researchers, we owe it to those who seek our help to provide them with the best assistance possible, regardless of our own biases and beliefs. In 1994, I faced an interesting dilemma when asked by one abductee about the availability of a local support group. He had read about abductee support groups in some of the popular abduction literature, and expressed a keen interest in talking with other abductees, discussing their similar problems and sharing coping strategies. On the one hand, support groups are a valuable tool in assisting individuals come to terms with their shared life experiences. This is true whether the group is one devoted to abductees or is a more traditional service such as Alcoholics Anonymous. The theory behind their use by counsellors in abductee recovery is that abductees will find solace and support from other abductees, and feel safe in talking about the intimate details of their encounters. The down side of this is that because abductees’ memories are often vague and distorted, and may be influenced by popular media, a detail found in one abductee’s story may be incorporated consciously or subconsciously into another abductee’s memory through contagion. This argument is at the heart of the noted case of Betty and Barney Hill, for example, where Betty’s describing of her dreams to Barney are thought by some to have influenced his own recall of events. Furthermore, if an abductee does have a morbid fear of aliens harming him or her, listening to others tell of their own suffering in alien hands may cause deeper fears to form. Among abductees, there is a great sense of camaraderie and sympathy. While each has his or her own subtle differences in their experiences, all abductees appear to share a sense of ‘not belonging.’ They often are ostracized by their co-workers, their friends and their families. Abductee support groups act as surrogate families for these who are in such distress and need some love and compassion. Some abductee support groups were founded by abductee therapists; others by abductees themselves wishing not only to help fellow experiencers but also as therapy for their own emotional crises. The ultimate benefit of abductee support groups is debatable. On the one hand, abductees need some kind of support or assistance from people who have an understanding of their experiences and who are going to be non-judgemental. But there are some caveats which much be addressed, too. From a research point of view, once one abductee speaks with another, there is always the possibility that the stories of their own experiences will begin to blend together. This form of data ‘contamination’ is a problem for abduction ufologists wanting to sort out the phenomenon. But another problem is related to the health and well-being of the abductees themselves. At least some abductees and contactees show signs or symptoms of psychological disorders. If these individuals are ‘counselling’ or ‘helping’ other abductees who are not ill, but are confused or are in some form of psychological distress, then are they helping or hindering the recovery of the new experiencers? In other words, when it comes to abductees, can the blind really lead the blind? My concern is for those who identify themselves as "experiencers" and join such a support group. Without adequate clinical care, some may experience further harm instead of healing. I read with interest your newest posting about ‘orange lights’ phenomenon. I have noticed this description in the reports increasingly often over the last ten or twelve years. Far and away the commonest sighting now, from what I can see, is nocturnal lights, orange in colour and often described as being in ‘triangular formation’. Clearly, any three things floating in the air at a distance HAVE to make a triangle, and the random floating movement of each point of that triangle could be mistaken for intricate maneuvers or rapid movements of some imagined solid object that the lighted points seem to outline. As for the orange colour – Chinese lanterns , as you note, could look like & actually ARE orange-ish lights. But I think you are also correct that atmospheric distortion might well bend or mask red & white nav lights into a murky yellow/orange/brown. Vince is of course completely correct in his note about "triangular" formations of lights in the sky. Any group of three lights in the sky are in, by definition, a triangular formation. So whenever I heard the description "three lights in a triangle," I recognize it at once as a red herring. Many UFO buffs make the incorrect assumption that it implies the lights are on a triangular object, which is usually not accurate. In fact, I would suspect that most reports of "huge triangular craft" are simply observations of three widely-separated lights. And yes, they are sane explanations. Question for me is, why is the ‘orange lights’ report so incredibly common particularly over the last decade? It definitely was NOT as common decades ago. I remember a lot of reports of red, white, blue, green lights – often alternating flashes or thrumming of these colours on some unknown object. This type of report seems to have gone by the wayside. Now we have the NL, orange, in formation. So, a fad, then? To me this is one of the most fascinating aspects of the whole phenomenon. How much of it is purely sociological or psychological? Indeed. Why has orange been such a predominant colour in recent decades? It wasn't all that long ago that "green fireballs" were the most common. Is there a psychological component at work? I've been studying the raw data of UFO reports in detail for 25 years. The 2013 Canadian UFO Survey, when completed in a few months (I hope) will be the 25th annual study of its kind, and the only one of its kind in the world. The vast majority of sightings this past year (and several previous years) involve observations of orange lights moving in the sky. In many cases (more than some might expect) the culprits have been Chinese lanterns. No, really. There have been cases where we received many reports of groups of orange lights moving in the sky and then someone points out that some lanterns were released in the area. And then we verified that the claim was true, and then matched the launching of the lanterns to where the UFOs were seen. And they fit. Now, what about cases where the UFOs observed act exactly like the ones that turned out to be lanterns, but we didn't get any reports of launchings that night? Does that mean that they were something else? Then there's the problem of some observations of orange lights that move faster than lanterns should. You know, where the witness says, "It zipped away really quickly." That doesn't sound like lanterns, which need light winds to fly best. Well, there's always mini-helicopters or drones, I suppose. The mini RCs often have lights so they can be seen at night and found later, but few RC enthusiasts would fly them in tandem and at night because of the risk of damaging or losing them entirely. Drones are another matter. Yes, they're being tested now and flown by military and aerial photo orgs but they're somewhat regulated. Besides, you'd hear them, and their trajectories would tend to be smooth. There are two ways to look at such observations. One is to try and figure out what could fly in such a manner and see if it can be matched to the witnesses' reports. The other way is to accept that witnesses' observational capabilities are often wrong. (We won't bother here with a third possibility, that the witnesses are just lying.) So if some witnesses report slow-moving lights and others report fast-moving ones, it's actually probable that they were watching the same things but with different interpretations of what "fast" and "slow" really mean. It's also probable that the witnesses reporting fast-moving objects were simply in error and that they only thought the objects they had seen moving slowly at first suddenly zipped away because they disappeared suddenly. 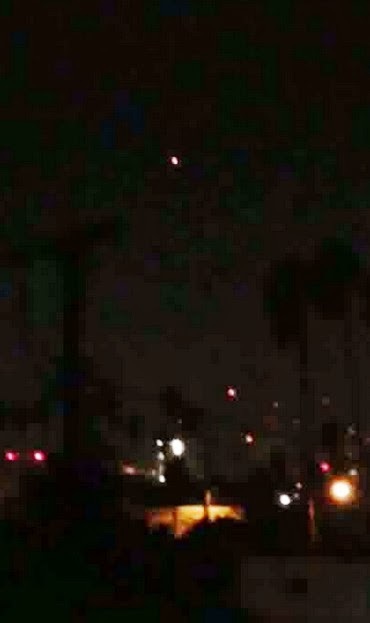 In the case of the many reports in California around New Year's Eve (when it should be obvious that Chinese lanterns and other things would be sent aloft in celebration) where there is a large population of potential witnesses, it has been conceded by UFO buffs that some of the UFOs seen in conjunction with the formation were lanterns, but say that some were not. But in southern California, like many urbanized areas, the presence of many airports and aircraft would suggest many UFOs seen at night will be explainable as airplanes. But here's the thing: people report seeing orange lights moving in the night sky, not aircraft. No strobes, no wingtip navigation lights. Why? I recall my university courses in physics and optics that taught me about how light is affected by atmospheric disturbance, distance and observational instruments themselves. I think the orange lights are simply white or red lights on planes seen at a distance through the atmosphere. The blinking lights and strobes won't be visible because of the distance. But I can't prove it. Yet. Readers of this blog might not be surprised to know that in parallel with the British hobby of trainspotting, there is an analogous version called planespotting. Yes, people spend their free time watching planes take off and land at airports. Who better to ask about lights on planes? Hi! I'm throwing a question out to anyone here, since you're more experienced than most people with this. I frequently get reports from people who see high-altitude, distant orange lights moving slowly in the night sky, sometimes (but not always) near airports. I'm fairly certain they are seeing planes, but witnesses insist they are not planes because the lights are steady and not flashing, and also that no red/green navigation lights are seen. My question is: what do planes look like at various distances in the night sky? Will the nav lights always be visible? Nav lights are required at night and are always visible. Light on the right wingtip is green, and that on the left wing is red. The aircraft strobes help draw attention to the airplane. These lights will be used when on an active runway, and also when below 10,000 feet. Flashing strobe lights are an excellent method of making other air traffic aware of the airplane. They are turned off when flying through clouds, because the intense flashing effect can be reflected back into the cockpit and cabin by the cloud, causing a blinding effect. Thanks for the prompt reply. Is there a distance effect? At a range of, say, three or four miles, will the nav lights still be visible? I'm puzzled at why there are so many reports of distant orange lights moving quickly in the sky. Above 10,000 feet, air traffic is equipped with transponders, which allow Air Traffic Control to see pertinent information such as speed and altitude. Because of this, the chances of an aerial collision is lessened, and the strobes can be safely deactivated. Okay, so this was reported as a UFO to Transport Canada: "On January 1, 2014, a witness reported seeing a UFO or something unknown in the sky in Maple Ridge, BC. He was in his hot tub at 00:10 PST New Year's Day when he saw 4 objects in the sky moving from south to north at a great altitude. The objects were orange or yellow in colour but not glowing; they were in formation an estimated 1/4 mile apart. They stopped, then flew towards the west. They were visible for about 5 or 6 minutes. The sighting was reported to the RCMP as well." Could these have been aircraft? Chris I think that when the visibility is very poor, the nav lights are not visible. That's what I wanted to know, thx. Okay, so that's from experienced aircraft observers. But it's not conclusive, is it? An experiment in "observational ufology." Set up near a major airport. Use Flightaware or some other program to track current flight activity, and watch the actual aircraft. How far away does a plane need to be before its nav lights are invisible? Do the colours of the lights shift with distance and direction or speed or altitude? Will they become distant orange lights? Are 737s different from 747s? Do lights on 747s appear different than those of Piper Cubs at various distances? Once we have some empirical observations, we can then say with some authority that yes, the orange lights seen by the UFO witness were likely aircraft. Or no, they weren't. And then we'd have another mystery to contend with. So we had those two Maple Ridge reports that seemed similar in several ways. Orange lights in the Northwest, moving slowly. Hours apart, but still curiously alike. And then MUFON got a report from January 2, also in BC, but this time some distance up the coast. Not only that, but the witness was someone who knows his sky. It happened at 9:35 UTC, on Cortes Island. Outside on my property viewed two unusual bright "stars" close together to the northwest relatively low to the horizon between a pair of trees. Estimated to be magnitude 0 or possibly even brighter, and immediately felt they were unfamiliar in the sky, two stars, that bright, that close together. Then I noticed they were slowly moving together against the background, eventually passing behind a tree, emerging out again on the other side of it, before disappearing from my view altogether behind the next set of trees. My initial thought is that they must be satellites, but it was quite late into the evening, and it is the middle of winter. Far too deep into Earth shadow for a low Earth orbiting satellite to be in sunlight. They were also moving very slow for satellites, so I gave some thought to the possibility of higher orbiting satellites, but they were very bright for that to seem likely. I checked a satellite database on my phone which revealed no passing satellites. I checked for Iridium flares scheduled for my location, but none were scheduled at this time, and it appears even Iridium satellites don't flare that late at night at this time of year here. Plus, there were two of these lights. I considered the possibility that these were like the NOSS triplets. I saw a set of NOSS triplets in 1997, and this was similar. The NOSS triplets are out of formation now, but apparently the Chinese Yaogan satellites fly in formation. I checked their known orbits and they don't seem like they were in the neighbourhood. I also believe their altitude places them too low to be in sunlight at that time of night. I am highly confident that these were not planes. Solid white/yellow steady star-like light, no sound, no nearby airports, very little air traffic on this part of the coast at all really. Honestly, I am stumped. I thought I would share, in case it's of any value to anyone, or if we are fortunate enough to learn of other reports. This guy really knows his sky. He even ruled out known NOSS and Iridium satellites. With his careful use of online resources, it's odd that he didn't mention FlightAware, which would have given some insight into aircraft activity. Nevertheless, an interesting report, even though they were only lights. But notice both the Maple Ridge sightings and this one from up the coast all report slow-moving orange lights in the northwest. There must be a clue there. Is it something as simple as some aircraft making runs up the coast? The lack of flashing aircraft wing lights is simple to explain; at a distance, navigation lights are no longer visible, and all you see is a steady light. Furthermore, at a distance, a red light will shift to orange. I think we need to do an actual observational experiment to see what happens when a standard aircraft flies into the distance. What do you actually see visually from the ground? As the flurry of New Year's Eve UFO reports start to make their way through the system, it's interesting to see the excitement in California and Oregon about the many sightings there. Breathlessly, UFO buffs are posting and reposting reports of multiple lights moving slowly (although in some cases, quickly) through the night sky that are DEFINITELY NOT FIREWORKS. Of course, many are. Many are also Chinese lanterns and remote control helicopters and drones. After I posted the note about the UFO over Maple Ridge on January 1, 2014, I was asked to look at a case also from Maple Ridge, but a few hours before. My wife and I stepped outside onto our back yard deck to have a cigarette just before 10:30 pm new years eve. Our back yard is situated facing due North. I happened to look up to see if the stars were out yet since I enjoy star gazing when ever possible. I noticed the two bright star like objects (#1 and #2) in the North Western sky, at approx. 35 (#2) and 45 (#1) deg above the horizon. The left most "star" (#2) was positioned at approx. 8:00 o'clock from the right one (#1). What surprised me was that they were identical in size,light coloration, intensity and were non-moving (their apparent size remained constant). I turned and asked my wife if the two stars were red or was my eye sight failing me. She confirmed the coloration and we kept watching in awe. For some reason my gaze started to wander and I caught sight of another "star" (#3)of the same size,coloration and intensity as the other two but this one was moving in a uniform arced vector from a 15 deg point of first sight above the horizon in a NW and vertical arced trajectory till it was positioned at approx. 30 deg above the horizon and at 6:30 o'clock from the first right most "star" (#1). When the third "star" reached its location it just stopped and the left most one (#2) started to grow smaller until we couldn't see it any more,this took about 30 sec. Just as the left one disappeared out of sight the two remaining started to grow smaller until both disappeared from sight, again this took about 30 sec. It appeared that the three "stars" had traveled in a perfect trajectory away from us since they just grew smaller in size with no wavering or erratic flight until they were out of sight. Although this report is much more detailed, it is easy to see how much it resembles the from from the following morning. It should be clear, though, that this sighting could also be lanterns. That the lights "grew smaller in size with no wavering or erratic flight until they were out of sight" simply means the air current was stable and that the objects were carried away in a smooth trajectory. By this point in the observation, though, the objects were several miles away and any wavering or irregularity to their movement would not be perceptible, anyway. On January 1, 2014, a witness reported seeing a UFO or something unknown in the sky in Maple Ridge, BC. He was in his hot tub at 00:10 PST New Year's Day when he saw 4 objects in the sky moving from south to north at a great altitude. The objects were orange or yellow in colour but not glowing; they were in formation an estimated 1/4 mile apart. They stopped, then flew towards the west. They were visible for about 5 or 6 minutes. The sighting was reported to the RCMP. Well, as I pointed out to someone, the likelihood of these being Chinese lanterns is pretty strong. People tend to send up more than one such lantern when they do so at festive occasions such as New Year's Eve, but they will usually be sent up one at a time, spaced evenly apart because you light them one at a time. Five minutes is almost exactly the duration of a Chinese lantern, too. And the change in direction could be due to the wind at a higher altitude, very consistent with a lantern. And, alas, the weather data available for New Year's Eve in Vancouver has a slight wind from the east, pushing things west. The apparent stopping could have been due to the witness' angle of observation. So I'd say the odds are pretty good we're talking about Chinese lanterns in this case.